The other day when joining some friends for dinner, as I was leaving to meet them, I called and asked if I could bring a bottle of wine. Yes, bring a Monterey County Red they said. Looking in the wine fridge there was only one! Usually there is three or four to choose from. A 2008 Syrah from Sycamore Cellars. Now this one was purchased because it was good wine at a good price, but not really with the idea of taking it to a restaurant for dinner. But since it was my only choice (only one at correct temp) and with only 30 seconds to make a decision, it was the one taken. 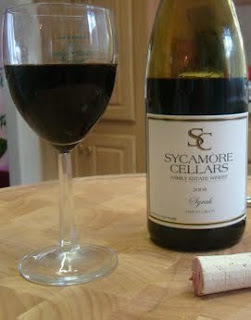 As it turned out it was a great choice, (as luck would have it) because this Sycamore Cellars Syrah was a great choice to go with the steaks most ordered, and also went well with my Rack of Lamb. The Syrah was a solid 6 and **** and with its medium body and with flavors of black currant and cherry, a slight smokey flavor that leads to a soft tannin finish turned out to be an expertly selected wine. Compliments from the group and that the bottle was drained very quickly, was validation of it's acceptance and how much it was enjoyed. 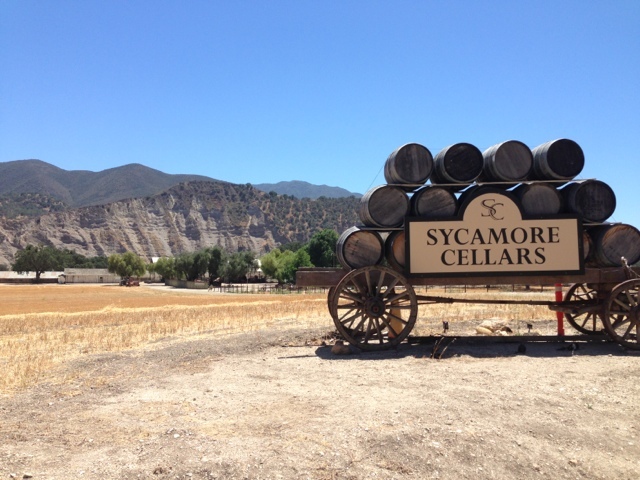 That bottle was the last of our Sycamore Cellars stock and as it was so "good" we will be going back for more. We think you should as well. Tell em we sent you!